To create a traffic policy, perform the following procedure. Design your configuration. For information about how complex DNS routing configurations work, see Configuring DNS Failover in Creating Amazon Route 53 Health Checks and Configuring DNS Failover. Based on the design for your configuration, create the health checks that you want to use for your endpoints. In the navigation pane, choose Traffic policies. On the Name policy page, specify the applicable values. For more information, see Values that You Specify When You Create a Traffic Policy. On the Create traffic policy policy name v1 page, specify the applicable values. For more information, see Values that You Specify When You Create a Traffic Policy. To delete a rule or an endpoint, click the x in the upper-right corner of the box. If you delete a rule that has child rules and endpoints, Amazon Route 53 also deletes all of the children. If you connect two rules to the same child rule or endpoint and you want to delete one of the connections, pause your cursor on the connection that you want to delete, and click the x for that connection. Optional: On the Create policy records with traffic policy page, use the new traffic policy to create one or more policy records in one hosted zone. For more information, see Values that You Specify When You Create or Update a Policy Record. You can also create policy records later, either in the same hosted zone or in additional hosted zones. If you don't want to create policy records now, choose Skip this step, and the console displays the list of traffic policies and policy records that you have created by using the current AWS account. If you specified settings for policy records in the preceding step, choose Create policy record. When you create a traffic policy, you specify the following values. Enter a name that describes the traffic policy. This value appears in the list of traffic policies in the console. You can't change the name of a traffic policy after you create it. This value is assigned automatically by Amazon Route 53 when you create a traffic policy or a new version of an existing policy. Enter a description that applies to this version of the traffic policy. This value appears in the list of traffic policy versions in the console. Choose the DNS type that you want Amazon Route 53 to assign to all of the records when you create a policy record by using this traffic policy version. For a list of supported types, see Supported DNS Record Types. If you're creating a new version of an existing traffic policy, you can change the DNS type. However, you can't edit a policy record and choose a traffic policy version that has a DNS type that is different from the traffic policy version that you used to create the policy record. For example, if you created a policy record by using a traffic policy version that has a DNS type of A, you can't edit the policy record and choose a traffic policy version that has any other value for DNS type. Choose the applicable rule or endpoint based on the design for your configuration. Choose this option when you want to configure active-passive failover, in which one resource takes all traffic when it's available and the other resource takes all traffic when the first resource isn't available. For more information, see Active-Passive Failover. Choose this option when you want Amazon Route 53 to respond to DNS queries based on the location of your users. For more information, see Geolocation Routing. When you choose Geolocation rule, you also choose the country or the state in the United States that requests originate from. Choose this option when you have resources in multiple Amazon EC2 data centers that perform the same function, and you want Route 53 to respond to DNS queries with the resources that provide the best latency. When you choose Latency rule, you also choose an AWS Region. For more information, see Latency-based Routing. Choose this option when you want Route 53 to respond to DNS queries based on the location of your resources and optionally on a bias that you specify. The bias allows you to send more traffic to a resource or more traffic away from a resource. Custom (enter coordinates) – If your endpoint is not an AWS resource, choose Custom (enter coordinates). An AWS Region – If your endpoint is an AWS resource, choose the AWS Region that you created the resource in. You can enter up to two decimals of precision, for example, 47.63. If you specify a value with greater precision, Route 53 truncates the value to two places after the decimal. For latitude and for longitude at the equator, 0.01 degree is approximately 0.69 miles. To expand the size of the geographic region from which Route 53 routes traffic to a resource, specify a positive integer from 1 to 99 for the bias. Route 53 shrinks the size of adjacent regions. To shrink the size of the geographic region from which Route 53 routes traffic to a resource, specify a negative bias of -1 to -99. Route 53 expands the size of adjacent regions. The effect of changing the value of Bias is relative, based on the location of other resources, rather than absolute, based on distance. As a result, the effect of a change is difficult to predict. For example, depending on where your resources are, changing the bias from 10 to 15 can mean the difference between adding or subtracting a significant amount of traffic from the New York City metropolitan area. We recommend that you change the bias in small increments and evaluate the results, and then make additional changes if appropriate. For more information, see Geoproximity Routing (Traffic Flow Only). Choose this option when you want Route 53 to respond to DNS queries with up to eight healthy answers selected approximately at random. For more information, see Multivalue Answer Routing. Choose this option when you have multiple resources that perform the same function (for example, web servers that serve the same website) and you want Route 53 to route traffic to those resources in proportions that you specify (for example, 1/3rd to one server and 2/3rds to the other). When you choose Weighted rule, enter the weight that you want to apply to this rule. For more information, see Weighted Routing. Choose this option to specify the resource, such as a CloudFront distribution or an ELB load balancer, that you want to route DNS queries to. Choose this option when you want to route DNS queries to an existing rule in this traffic policy. For example, you might create two or more geolocation rules that route queries for different countries to the same failover rule. The failover rule might then routes queries to two ELB load balancers. This option isn't available if the traffic policy doesn't include any rules. Choose this option when you want to route DNS queries to an existing endpoint. For example, if you have two failover rules, you might want to route DNS queries for both On failover (secondary) options to the same ELB load balancer. This option isn't available if the traffic policy doesn't include any endpoints. Choose this option if you want to route traffic to a CloudFront distribution. The option is available only if you chose A: IP address in IPv4 format for DNS type. Choose this option if you want to route traffic to an ELB load balancer. The option is available only if you chose either A: IP address in IPv4 format or AAAA: IP address in IPv6 format for DNS type. Choose this option if you want to route traffic to an Amazon S3 bucket that is configured as a website endpoint. The option is available only if you chose A: IP address in IPv4 format for DNS type. Choose this option if you want Route 53 to respond to DNS queries using the value in the Value field. For example, if you chose A for the value of DNS type when you created this traffic policy, this option in the Value type list will be Type A value. This requires that you enter an IP address in IPv4 format in the Value field. Route 53 will respond to DNS queries that are routed to this endpoint with the IP address in the Value field. Choose a CloudFront distribution from the list of distributions that are associated with the current AWS account. Choose an ELB load balancer from the list of ELB load balancers that are associated with the current AWS account. Choose an Amazon S3 bucket from the list of Amazon S3 buckets that are configured as website endpoints and that are associated with the current AWS account. When you create a policy record based on this traffic policy, the bucket that you choose here must match the domain name (such as www.example.com) that you specify for Policy record DNS name in the policy record. If Value and Policy record DNS name don't match, Amazon S3 won't respond to DNS queries for the domain name. Enter a value that corresponds with the value that you specified for DNS type when you started this traffic policy. For example, if you chose MX for DNS type, enter two values: the priority that you want to assign to a mail server and the domain name of the mail server, such as 10 sydney.mail.example.com. For more information about supported DNS types, see Supported DNS Record Types. A geoproximity rule lets you specify the locations of your resources, both in AWS Regions and, using latitude and longitude, in non-AWS locations. When you create a geoproximity rule, Route 53 routes internet traffic to the resource that is closest to your users by default. You can also choose to route more or less traffic to a resource by specifying a bias that expands or shrinks the geographic area from which traffic is routed to a resource. For more information about geoproximity routing, see Geoproximity Routing (Traffic Flow Only). 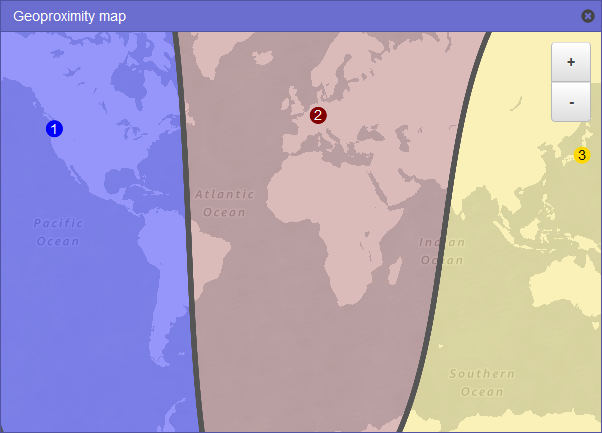 You can display a map that shows the effect of your current geoproximity settings. For example, if you have resources in the US West (Oregon), EU (Frankfurt), and Asia Pacific (Tokyo) Regions, and if you don't specify a bias, the map looks like this. To display the map for a geoproximity rule, choose the graph icon next to Show geoproximity map. (This icon appears at the top of the rule.) To hide the map, choose the icon again or choose the x in the upper right corner of the map. The map is accurate to within approximately 10 miles (16 kilometers). The map automatically adjusts when you add, edit, or delete regions, or when you change the bias setting for a region. The region number and color in each rule definition correspond with numbers and colors on the map. You can zoom in and zoom out to see more or less detail. Use the + and – buttons on the map, a touchpad, or the wheel on a mouse to change the zoom level. You can move the map around inside the map window to see specific areas. Use a touchpad, or click and drag the map with a mouse. You can also move the map window in the browser window. If you have more than one geoproximity rule in a policy, you can view the map for only one rule at a time. When you edit a traffic policy, Amazon Route 53 automatically creates another version of the traffic policy and retains the previous versions unless you choose to delete them. The new version has the same name as the traffic policy that you're editing; it's distinguished from the original version by a version number that Route 53 increments automatically. You can base the new version of a traffic policy on any existing version of a traffic policy that has the same name. Route 53 doesn't reuse version numbers for new versions of a given traffic policy. For example, if you create three versions of MyTrafficPolicy, delete the last two versions, and then create another version, the new version is version 4. By retaining the previous versions, Route 53 ensures that you can roll back to a previous configuration if a new configuration doesn't route traffic as you wanted it to. To create a new traffic policy version, perform the following procedure. Choose the name of the traffic policy that you want to create a new version of. In the Traffic policy versions table at the top of the page, select the check box for the traffic policy version that you want to use as a basis for the new traffic policy version. Choose Edit policy as new version. On the Update description page, enter a description for the new traffic policy version. We recommend that you specify a description that distinguishes this version from other versions of the same traffic policy. When you create a new policy record, the value that you specify appears in the list of available versions for this traffic policy. Update the configuration as applicable. For more information, see Values that You Specify When You Create a Traffic Policy. If you delete a rule that has child rules and endpoints, Route 53 also deletes all of the children. When you're finished editing, choose Save as new version. Optional: Specify the settings to create one or more policy records in one hosted zone by using the new traffic policy version. For more information, see Values that You Specify When You Create or Update a Policy Record. You can also create policy records later, either in the same hosted zone or in additional hosted zones. You can create a new traffic policy or a new version of an existing traffic policy by importing a document in JSON format that describes all of the endpoints and rules that you want to include in the traffic policy. For information about the format of the JSON document and several examples that you can copy and revise, see Traffic Policy Document Format in the Amazon Route 53 API Reference. The easiest way to get the JSON-formatted document for an existing traffic policy version is to use the get-traffic-policy command in the AWS CLI. For more information, see get-traffic-policy in the AWS CLI Command Reference. Choose the name of the traffic policy that you want to base the new version on. In the Traffic policy versions table, select the check box for the version that you want to base the new version on. On the Update description page, enter a description for the new version. Enter a new traffic policy, paste an example traffic policy, or paste an existing traffic policy. You can view all of the versions that you've created for a traffic policy as well as all of the policy records that you've created by using each of the versions of the traffic policy. Choose the name of a traffic policy. The number of each version of a traffic policy that you've created. If you choose the version number, the console displays the configuration for that version. The number of policy records that you've created by using this traffic policy version. The DNS type that you specified when you created the traffic policy version. The description that you specified when you created the traffic policy version. The DNS names that you've associated the traffic policy with. Route 53 has finished creating or updating a policy record and the corresponding records. Route 53 is creating the records for a new policy record. You have updated a policy record and Route 53 is in the process of creating a new group of records that will replace the existing group of records for the specified DNS name. Route 53 is in the process of deleting a policy record and the associated records. Route 53 wasn't able to create or update the policy record and the associated records. Indicates the version of the traffic policy that you used to create the policy record. The DNS type of all of the records that Route 53 created for this policy record. When you edit a policy record, you must specify a traffic policy version that has the same DNS type as the DNS type for the policy record that you're editing. The amount of time, in seconds, that you want DNS recursive resolvers to cache information about this record. If you specify a longer value (for example, 172800 seconds, or two days), you pay less for Route 53 service because recursive resolvers send requests to Route 53 less often. However, it takes longer for changes to the records (for example, a new IP address) to take effect because recursive resolvers use the values in their cache for longer periods instead of asking Route 53 for the latest information. To delete a traffic policy, you must delete all of the versions (including the original) that you've created for the traffic policy. In addition, to delete a traffic policy version, you must delete all of the policy records that you created by using the traffic policy version. If you delete policy records that Amazon Route 53 is using to respond to DNS queries, Route 53 will stop responding to queries for the corresponding DNS names. For example, if Route 53 is using the policy record for www.example.com to respond to DNS queries for www.example.com and you delete the policy record, your users will not be able to access your website or web application by using the domain name www.example.com. Choose the name of the traffic policy for which you want to delete traffic policy versions and that, optionally, you want to delete completely. If the traffic policy versions that you want to delete in the top table appear in the Version used column in the bottom table, select the check boxes for the corresponding policy records in the bottom table. For example, if you want to delete version 3 of a traffic policy but you created one of the policy records in the bottom table by using version 3, select the check box for that policy record. Choose the refresh button for the bottom table to refresh the display until the policy records that you deleted no longer appear in the table. In the top table, select the check boxes for the traffic policy versions that you want to delete. If you deleted all traffic policy versions in the preceding step and you want to delete the traffic policy, too, choose the refresh button for the top table to refresh the display until the table is empty. In the list of traffic policies, select the check box for the traffic policy that you want to delete.